The youngest of the Nightroad siblings, Seth became the Empress Augusta Vradica of the New Human Empire. 800 years ago, she led the Methuselah to safety and helped restore natural life to the land where the Empire eventually rose. Her people see her as their mother, and she does them as her children. No one’s actually seen what she looks like though, because of the heavy veils she puts on when she speaks to them and she uses a voice modifier as well. Because of this, she can easily move around the city without being noticed. Awesome cosplay! The details on the costume is quite stunning and impressive! Oh, did I mention that the character looks like a little girl but she’s actually 900 years old? Comes with being a crusnik I guess! The elder twin brother of Abel Nightroad and the main Antagonist of the story, Cain is the oldest of the Test Tube Babies who was once the beloved leader of the Mars Colonization project. Because of an accident, his younger brother Seth injected him with Crusnik nanomachines, a sort of vaccine that turns normal humans into vampires that feed on the blood of other vampires. This saved Cain’s life, but it also drew him into insanity. His decision to support the Vampire Returners and to murder prototype Lilith Sahl angered Abel and Seth, killing Cain in the process. But it seems even turning Cain’s Crusnik body into ashes is still not enough to stop him, as he is able to regenerate later on in the series. This is a most impressive cosplay of Cain! It’s rather controversial that Cain looks angelic and Abel looks demonic, when the two of them play opposite roles! But you really have to love the details of his armor! The sadistic Puppet Master who thinks of people as merely his toys, Dietrich von Lohengrin is described to be a genius with an angelic face and a demonic heart. He is also the only known Terran in the Rosen Kreuz Orden. As a young child, his father had realized Dietrich’s evil nature and tried to kill him. Dietrich ended up killing his father as well as his entire family at a young age. He joined Rosen Kreuz Orden later at the age of 7 and became a high ranking official in the age of 10. Such an impressive cosplay! 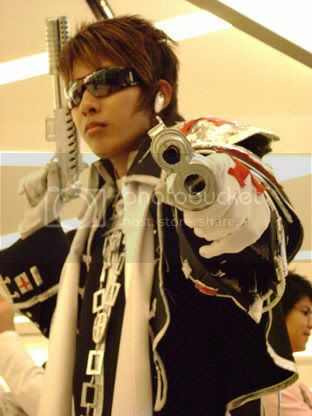 I found this in a website that features a ton of Trinity Blood cosplays! Make sure you guys visit! I’ll post a few more from them soon. The mechanical soldier created by Vatican Scientist, Professor Gepetto Garibaldi, Father Tres Iqus is one of ten “Killing Dolls” to be used for an attempted rebellion. He was spared from destruction and recruited by Cardinal Caterina Sfroza for AX, the Minister of Holy Affairs’ Special Operations Group. Father Tres is part mechanical and part organic, and he maintains his body by taking vitamins. You can tell straight off that he’s a cyborg, because he always answers questions with either “negative” or “positive”, though there are times when he shows some emotions and even a sense of humor. You are currently browsing the archives for the Trinity Blood category.